Here we take a look at the salary situation in Spanish primera division at the start of 2015/16 season. Looking at it financially, the league is basically divided in three groups of teams. On top are Real and Barca, in the middle Atletico, Valencia and Sevilla, and in the third group there is everybody else. Real Madrid had a salary budget of €530m last season, Barca €510m. These two teams are at the top of the food chain in Spanish and world club football. It comes as no surprise to see that the top 10 highest paid La Liga players this season all come from either Real or Barca. Atletico Madrid had a €170m budget last season, Sevilla €100 and Valencia €89. These budgets are far behind Real and Barca's, but well ahead of the budgets of the other La liga teams. Atletico, Sevilla and Valencia sell their best players season after season, but manage to stay competitive domestically and on the European scene. Sevilla won the Europa League two years running and are looking to continue their momentum this season in the Champions League. Atletico made it to the Champions League final the year before last, while Valencia have had a fresh influx of funds with recent change in ownership; they also have a place booked in the 2015/16 UEFA Champions League group stage. After the top five in Spain there is everybody else. The budgets of teams like Levante and Rayo are €22m. At Eibar the annual salary budget is €18m. 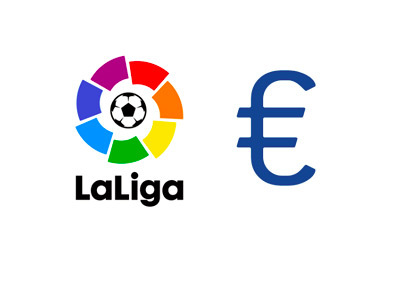 Less than half of the players in La Liga earn more than €500m / season. The minimum annual salary is €129m.